Zachary Quinto is returning to the hit drama, American Horror Story. The actor, who guest starred on season one, is coming back for more. This time, he’ll co-headline the series alongside Jessica Lange and a few more familiar faces. American Horror Story, the breakout hit from Ryan Murphy and Brad Falchuk, is getting a cast/character makeover. Last October, AHS was headlined by Dylan McDermott (The Practice), Connie Britton (Friday Night Lights) and Taissa Farmiga with support from Jessica Lange, Evan Peters and a slew of recurring actors. 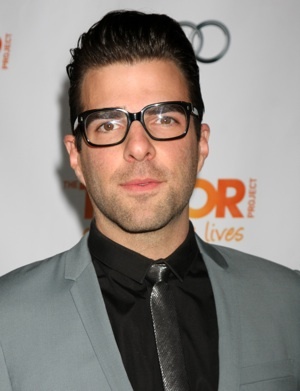 Star Trek‘s Zachary Quinto appeared in four episodes as Chad, a former resident of the haunted horror house. His role was small, but played an important part in the overall story. Thanks to him, we learned the origin of the creepy rubber man suit. Well, someone got their wish! According to Deadline, Quinto will return next season but as a completely different person. Chad has run his course. American Horror Story is an anthology series, which means the story, cast and characters consistently change. Murphy claims that season two will be filled with familiar faces. He confirmed that several of last year’s stars will reappear, but in all-new roles. So far, only Quinto and Lange have officially been announced. Murphy’s expected to reveal the rest of the cast at the 2012 PaleyFest. It’s been reported that “Quinto will play one of two male leads and the nemesis to Lange’s character, which will be at the center of the season two storyline.” The show will move on from the haunted West Coast mansion, to an East Coast institution. What do you think of Quinto and Lange returning as new characters?